Friends of the Elderly’s patron is The Queen and each year we are invited to the Buckingham Palace garden parties and select staff. This year the two staff members who attended are part of our sister organisation, Triangle Community Services. Sandra Smook, Manager of Visiting Friends befriending service, and Margaret Buxton-Brown, Manager of Triangle Home Care Sutton were selected based on length of service with the organisation. 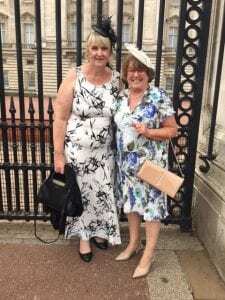 Sandra said: “It really was a once in a lifetime opportunity.” They were incredibly lucky with the weather and were overwhelmed by the size and beauty of the garden at Buckingham Palace. The party began at 4pm when members of The Royal Family gathered on the West Terrace for the National Anthem. Stewards then formed a pathway for The Queen to walk down with Prince William, Princess Eugene, The Duke and Duchess of Gloucester, the Duke of Kent and Princess Alexandra. “It was incredible being so close to The Queen and members of the Royal family. We then enjoyed a beautiful tea and were entertained by the Band of the Household Cavalry and the Band of Royal Logistics Corps. It really was an incredible experience and a wonderful memory,” said Sandra.